I'm really excited about this announcement today! 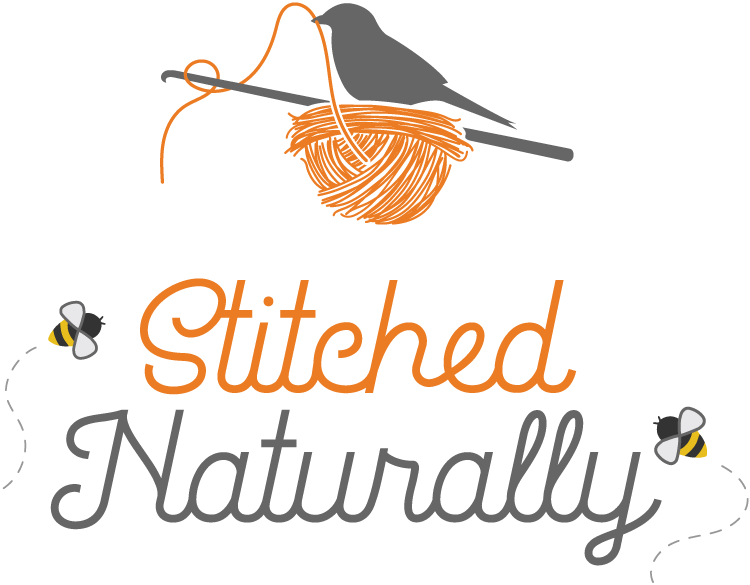 It's been a while in the making, I tell ya, but today is the day for the release of my newest pattern and announcement of a CAL (crochet-a-long) for it! It's made by working 5 panels using a bunch of different stitches, some unusual stitch placements and an abundance of color. The name is apt, I think. No surprise about the color-rush here, right? It's made with every color of Scheepjes River Washed (1 ball of each of 22 colors) and Scheepjes Colour Crafter (5 balls of white) as the main color. 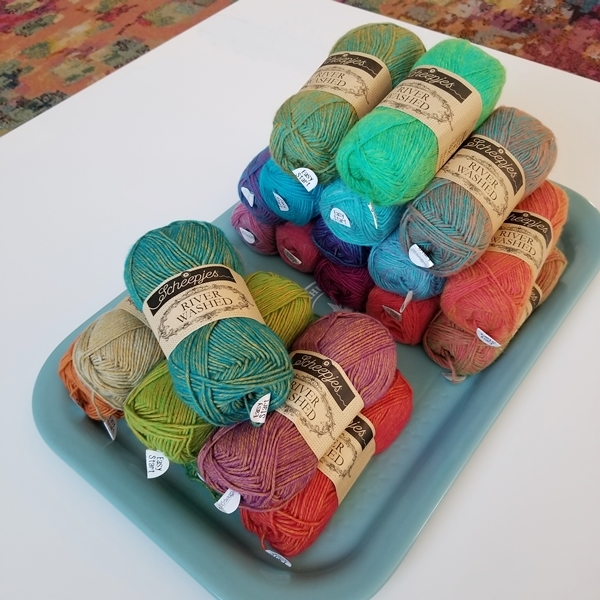 You can read my thoughts about (and deep affection for) both River Washed here and Colour Crafter here. All in all, I'm really tickled with it--the texture, rich jewel-toned color-play, and variety of techniques which make it a perfect project for an adventurous beginner, as well as the experienced crocheter. In other words, if you've got some mad skills, it's challenging enough to be fun. If you're wanting to learn some new things, this is your chance. 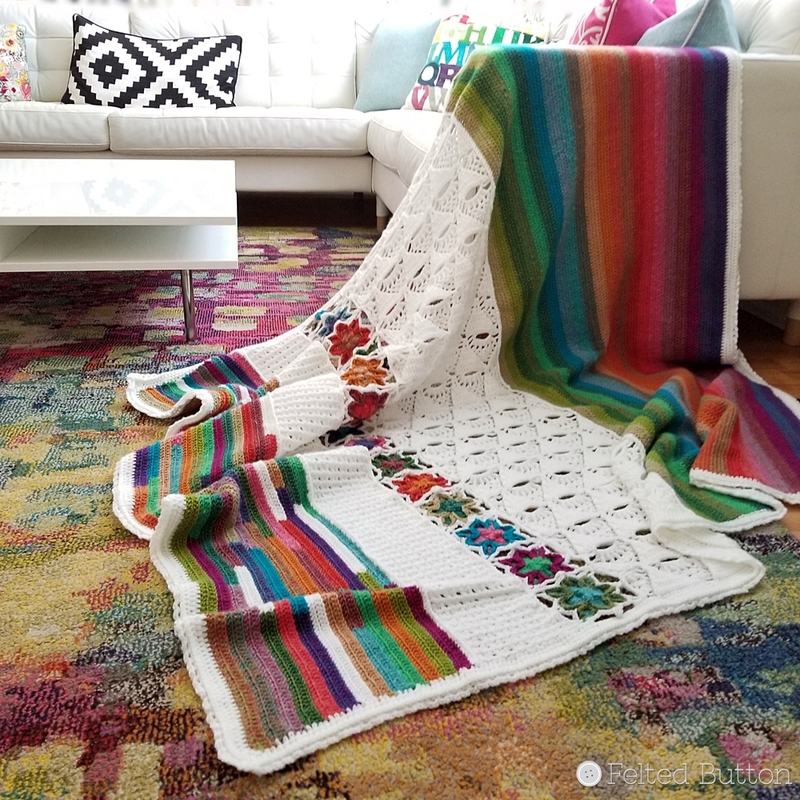 After polling folks on my Instagram about the idea of holding a Crochet-A-Long (CAL) for the blanket and receiving a resounding "Yes! ", I decided to move forward with that idea. I think it is the perfect blanket for a CAL because it contains lots of different crochet techniques--definitely not a boring project. You'll get some simple portions with relaxing "let's watch TV" kind of crocheting and some more challenging sections that require more focus, as well as motifs, rows, and simple join-as-you-go. I hope you join me! Pattern: Click here to get the blanket pattern on Ravelry (25% discount using coupon code 5DCAL) through 12/18/2108, MT. You can read all the details about the pattern there or get your pattern on Etsy or LoveCrochet. Materials and Yarn Kits: You'll need a 4mm hook and approximately 3800m/4160yds of DK/Sport weight yarn. One click here* for all the yarn you need to complete the blanket. Hurry, the kits will sell quickly, but if they are out of stock there will be more available next week! By the way, the blanket's dimensions are 55” x 64” (140cm X 163cm) which is the perfect size for a throw, I think. CAL Facebook Group: If you would like to officially participate in the CAL, join my Felted Button Crochet Facebook group here. 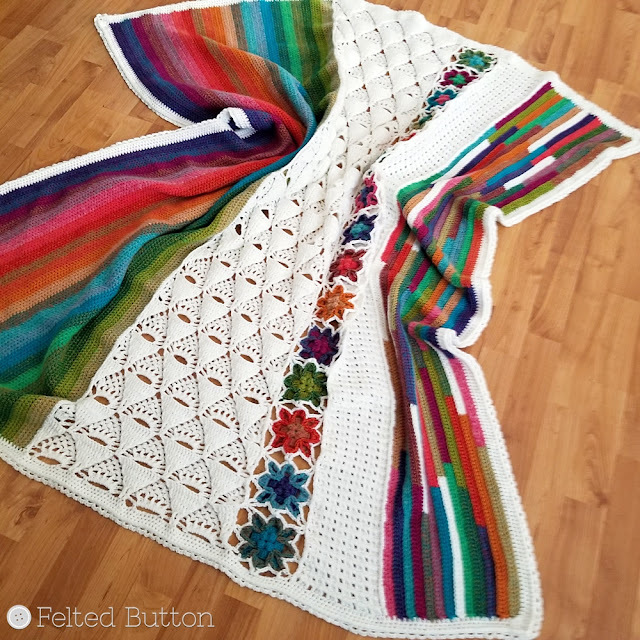 This CAL along with other CALs (including my annual temperature blanket CAL), pattern releases, giveaways, project sharing, and crochet support can all be found in the group. Click here to ask to join. Once you are added to the group, please familiarize yourself with the group rules. It's a place to ask questions, share what you are working on, and celebrate progress and finished projects. 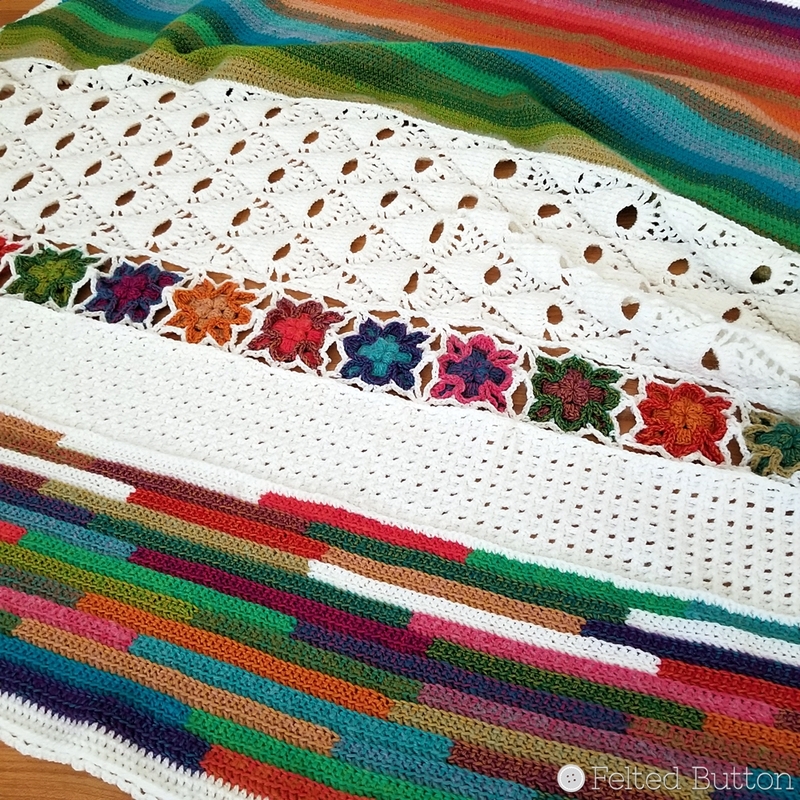 If you are not a Facebook user, you can also check here on my blog for on-going announcements about the 5th Dimension Blanket CAL. Following along on Instagram is also a good way to keep in the Felted "Button" Loop. Remember, I'm FeltedButton everywhere! Dec 15-Dec 31 Grab your complete yarn kit from my Deramores shop here* with all the yarn you need in one click. You can also find the yarn separately. 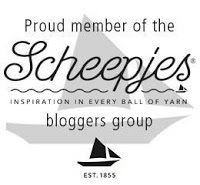 Here is a list of Scheepjes stockists. 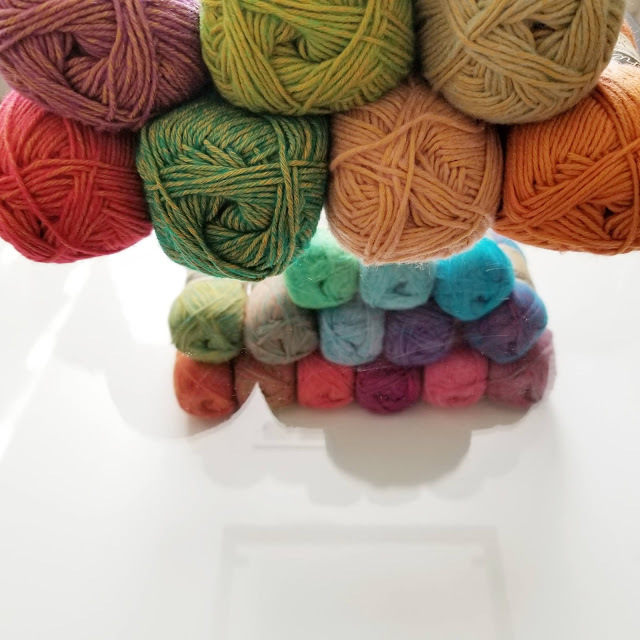 I decided to hold off beginning the CAL until after the busy holidays and the start of a new year, so between now and then, grab your pattern, gather that yarn, clutch it tightly, jump up and down in gleeful anticipation, and enjoy this holiday season with family and friends. I'm doing just that today as some dear friends are on their way over to visit. *This post contains affiliate links. If used by you they cost you no more but provide me a small commission. Thank you!